The U.K. based WaterAid campaign urges Britain to keep their showers short with a specially timed playlist. Conserving water is so hot right now. Or at least, that’s what international non-profit organization WaterAid is trying to convey with a new U.K.-based Spotify campaign created by Y&R London. 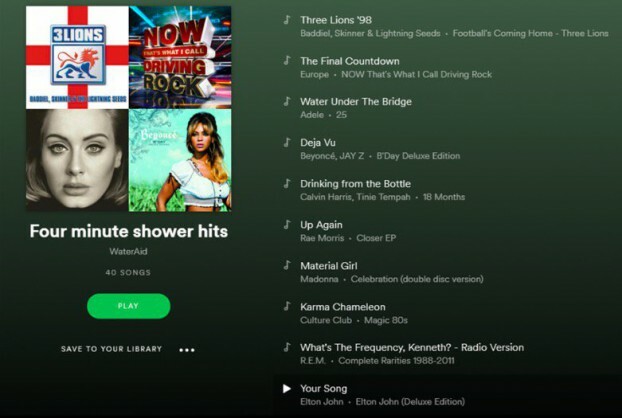 Tapping into the country’s need to save water during a great British heatwave, the charity is urging people to keep their showers short by tuning into a perfectly timed playlist. The playlist features song by the likes of Adele, Beyoncé, R.E.M. and Elton John that just so happen to be exactly four minutes – WaterAid’s recommended shower time. And, of course, there’s Europe’s classic (and lyrically appropriate) hit, “The Final Countdown.” GOB Bluth is definitely on board. The U.K. has been experiencing uncharacteristically warm temperatures above 28 degrees for close to three weeks, the longest heatwave since 2013. The highest temperature on record this year was in North Wales, which reached 33 degrees on June 28.